Jonathan has been practicing yoga, meditation and buddha-dharma since 2003 and teaching since 2011. His foundational practices have been Ashtanga Vinyasa Yoga (in the tradition of Shri K. Pattabhi Jois) and vipassana meditation (in the tradition of S.N. Goenka). In 2013 he began working with the rich teachings and practices of Vajrayana and has more recently begun a study of Taoist energy arts including Qigong. Jonathan’s main teacher of buddha-dharma (abhidhamma and vajrayana / dzogchen traditions) is Lama Mark Webber, whose root teacher was the Venerable Namgyal Rinpoche. 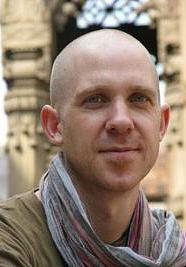 His main yoga teacher was John Scott, who is a direct student of Pattabhi Jois. In addition, Jonathan has studied Qigong and Qigong Tui Na with Taoist lineage holder Bruce Frantzis. Jonathan has been given the blessing to teach dharma and meditation by Lama Webber and is a YA200 registered yoga teacher with the Yoga Alliance having completed teacher training with John Scott. Jonathan lives in Nelson, New Zealand with his partner and two young children. He integrates a full family life with a dedication to the practice and teaching of a universal path of awakening.